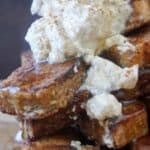 French Toast the Keto Way! Ok, so this recipe might be cheating a tad bit, because it relies on our signature keto bread recipe. If you haven’t made it before, check it out! It’s super simple and comes out consistently great every time. Conquering keto bread can really help with adherence to the keto diet if you’re having trouble giving up all of your old favorite dishes. We’re going to take this bread on a magical journey and turn it into low carb french toast sticks! We’re going to make this low carb french toast the same way you would make traditional french toast, with the only difference being that we are using low carb bread. This recipe can also be used for normal french toast, but I prefer to go with french toast sticks because you have more surface area, and therefore more flavor gets into the bread. The mixture we are going to coat the bread in is also very easy to customize based on the flavors you’re going for. I’m a big fan of maple cinnamon french toast, so that’s what I go with here. 1 egg makes enough batter for 8-10 large french toast sticks, so scale up this recipe accordingly. Combine 1 egg, 1 tbsp cream and any other flavors you want. I add 1/4 tsp vanilla, and 1/2 tsp cinnamon. If you have a liquid sweetener you are going to want to add it into the batter mixture as well. If you plan on using a powdered sweetener you can dust it on at the end. I usually omit sweeteners when cooking for myself, but these are definitely boosted by a bit of sweetener. Once coated in the batter you have a few options with your low carb french toast sticks. You can let them sit for 5 minutes so the batter penetrates to the middle and makes the bread a bit soggier/moister. This will result in a softer center in the finished product. I like to throw mine in the pan right after I coat them. We’re going to be frying these in Ghee, but you can also use coconut oil. Cook for about 2 minutes per side, for a total cook time of 8 minutes or until golden brown. Stack the finished low carb french toast sticks into a stack and top with butter and sugar free maple syrup. Redi Whip also goes great on these and is relatively low carb. If you want to get crazy you can whip up your own whipped cream(as shown in the picture). Just use 1/2c heavy whipping cream, some sweetener, and maybe even some cinnamon and beat for 1-2 minutes. Enjoy! If you haven't already, start by baking a loaf of Our Favorite Keto Bread! Server with butter and sugar free syrup and dust with cinnamon. Enjoy! 1 Serving is 8 French Toast Sticks. The nutrition listed is for 1 serving, which is all 8 French Toast Sticks.